When he speaks from the Oval Office on Tuesday night, Barack Obama will deliver one of the hardest addresses of his presidency. Yes, he's had tough ones before  on Afghanistan, health care and the BP oil spill. But Tuesday's speech marking the end of the U.S. combat mission in Iraq confronts Obama with a subject that defies easy explanation, a policy that allows little self-congratulation and a political climate in which Iraq's place is not clear. There are three reasons for that lack of clarity. The first is that Iraq itself is in an inconclusive place. The Obama Administration had hoped that by now a third democratically elected government would be functioning in Baghdad, but five months after national elections in March, a political stalemate drags on (raising concerns over a possible call for new elections). Iraq may yet emerge as a relatively American-friendly exemplar of Middle East democracy. But it's still possible that more chaos and civil war  perhaps leading to something far more sinister  lie around the corner. Obama simply can't claim closure. The President's second problem is how little he can claim to have accomplished in Iraq. He is certainly entitled to brag about meeting his 2008 campaign promise to withdraw U.S. combat troops. (Obama will leave behind a smaller force of about 50,000 troops  ostensibly trainers but in practice soldiers who will likely also perform some combat duties  until the end of next year.) But when Obama first made that promise, in 2007, the country was gripped by bloody civil warlike conditions and the American mission there still looked like an overall failure. Walking away under those circumstances would have involved huge moral and political costs, ones that Obama said he was willing to bear in the name of the national interest. Today, however, Iraq is relatively peaceful and its steep decline in violence has fended off the taint of defeat and retreat. What's more, the current U.S. withdrawals are broadly in line with an agreement reached between the Iraqi government and the Bush Administration. Obama is fulfilling a promise that was bold when he made it, but far less so now. Meanwhile, Obama's diplomatic team  led by an actively engaged Vice President Joe Biden  has thus far failed to cajole the Iraqis into the sort of political reconciliation that would constitute real success. (Not that it was an easy task.) And Obama has made little progress on some other worthy goals he set as a candidate that receive little media attention. 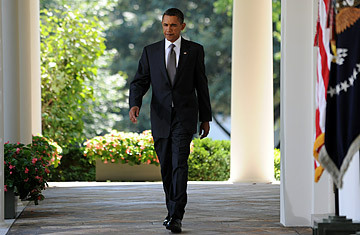 In September 2007, Obama outlined his withdrawal plan in an address in Iowa. It included pledges to create a new regional diplomatic compact among Iraq's neighbors, $2 billion in spending to aid Iraqi refugees, more help getting Iraqi translators who had helped the U.S. out of the country to safe places and the creation of a U.N. commission to investigate war crimes committed by warring parties after the U.S. invasion. Obama's third challenge is a political one. With Democrats in a near panic that the sputtering economy is setting them up for a political blowout  the latest Gallup poll shows Republicans holding an unprecedented advantage on the generic congressional ballot  Obama's allies are desperate to show their focus on job creation. Some fret that any prime-time address Obama makes right now should be about economic, not foreign, policy. "Why is he giving an Oval Office address on Iraq?" laments a House Democratic aide. "We want  need  to be talking about jobs and the economy. Anything else is a distraction." Nor are many of the people who do want to hear more about Iraq likely to applaud the President. Conservatives grumble that he has given up on George W. Bush's war (and won't admit that his opposition to the surge may have been wrongheaded). Liberals don't like that Obama is leaving 50,000 troops behind. He can't win. There is one last challenge that clouds Obama's entire speech, and that is the small matter of the grueling slog in Afghanistan. By all indications the war effort is not going well, yet Obama has said little about it to the American public in the past several months. That may be because Afghanistan is looking increasingly like Obama's Iraq  an unpopular war that the President must defend on national-security grounds rejected by many Americans. In his 2007 Iraq address, Obama cited his own words from the famous October 2002 speech he gave opposing the then coming Iraq invasion: Obama warned that the war could lead to "a U.S. occupation of undetermined length, at undetermined cost, with undetermined consequences." It was a prescient warning. But in a twist of fate, those words might also apply to Obama's troubled war in Afghanistan. As if commemorating America's inconclusive exit from Iraq wasn't already hard enough. See pictures of a civilian casualty in Afghanistan. See pictures of a unit's last days in Iraq.